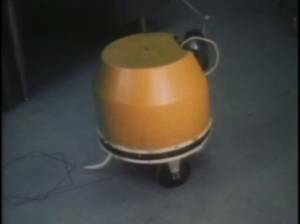 The "Yellow Turtle" is a tricycle, and uses a "tail" for stability and undercarriage viewability. This is the first turtle built and was built by Tom Callahan at MIT in 1969-70. When it was first built, it was not referred to as a "turtle". This was to come when Mike Paterson was invited (see article Toward a Culture of Creativity below).